Canale’s latest children’s book explores reasons that make the city great. Suzie H. Canale is a true-blue New Englander and her books reflect that sense of place.Her newest book, “Boston, You’re My Home,” published by Mascot Books in 2014, is about a little girl struggling with the change of moving to her new home in Boston.The book is illustrated by Roberto Almanza, an Illinois-based children’s book artist.According to Canale, the little girl’s fears, “converts to excitement when her parents tell her a bedtime tale comprised of 10 reasons which make Boston Strong.”Profits from her book are being donated to One Fund of Boston.One Fund Boston is a nonprofit organization started in April 2013 to help those most affected by the Marathon bombings.“It’s been a great feeling to give back to the city I love,” Canale said.She currently lives in Westwood, and has been writing professionally for five years, although she has been writing for years before selling her first books.“I started making up stories about the flowers I saw in my parents’ wholesale floral company when I was eight years old… My first book is about the chocolate cosmos flower that actually smells like chocolate,” she said.Canale said she loves storytelling.“It’s incredibly therapeutic and honestly, I love nothing more to entertain a reader with new concepts or thoughts,” she said.She has written a series of children’s books in prose called, “The Beantown Tales.”The books include: “The Land of Chocolate Cosmos,” “The Popcorn Hydrangea of Poppingtom,” “The Candy Roses of Cape Care” and “Boston, You’re My Home.”According to Canale, the first three books seek to teach children about environmental issues including recycling, air pollution and natural resources, while the fourth book celebrates Boston pride.In 2014, Beach Bound Books hailed her book as “a wonderfully written and charmingly illustrated story that takes readers on a tour through Boston. Children will discover amazing places like the Hatch Shell, The Emerald Necklace, Castle Island… Sweet Caroline learns, the most impressive part of Boston are the remarkable people who live there and the strong bond they share.”Canale said she likes to write her books in poetic form because “ it grabs young readers’ attention, quicker than many other formats.”“Writing these books have led to the creation of my children’s writing program, ‘How To Make Your Own Book’ workshop, which teaches children the publication process,” Canale said.“I have instructed this course as an afterschool program as well as in libraries and school classrooms across Massachusetts,” she said. After a lengthy career in the Boston wholesale floral industry, Suzie Canale turned her talents to writing for children. 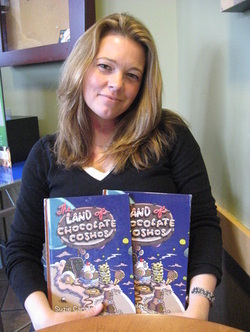 Her initial book, “The Land of Chocolate Cosmos,” was recognized by the 2011 New England Book Festival and served as the genesis for an ongoing series, The Beantown Tales. Now the author of three children’s books, including “The Candy Roses of Cape Care” and “The Popcorn Hydrangea of Poppington,” Canale has also written a wedding-focused e-book and is a regular blogger and contributor to online publications. She was named 2012 Author of the Year by Mascot Books Publishing and has garnered several awards for her books. SNHU recently connected with Canale to learn more about her writing background and plans for the future. Yes, thinking back, I have always written. I was particularly interested in writing poetry and would often leave samples of prose for my parents on the table to read before they went to work. I always thought of it as a game and would get a kick out of finding words that not only would tell a story, but would also blend together in a rhyme. What led you to create The Beantown Tales? After my first book was released, “The Land of Chocolate Cosmos,” I knew I wanted to write more. I also knew that writing a series, as opposed to a single book, would have its benefits in both marketing tactics and longevity with a reading audience. I also wanted to write a very clear message present in all of the stories that would teach children that they have the power to influence positive changes within our society. Once I made this plan, I mapped out a list of ten books, which would be split into three sections ending with a tenth installment as the finale. The categories would later become the “Green” series (environmentalism), the “Do Good” series (humanitarianism), the “Animal Kindness” series (endangered animal preservation) and the grand finale that I think I will keep as a surprise! The name of the series, “The Beantown Tales,” was written after my Boston roots and my love for Bean Town with the “tales” as a pun on the word storybooks. Creating the series has been a lot of fun, even when playing with The Beantown Tales logo, which grows a vine with a book attached with every new release. Can you tell us about your publishing experience? How important has self-marketing been for your books? Self-marketing is incredibly important regardless of the means you go through publishing. There is absolutely no better person to sell your books than you, so it’s important to get out there! Whether the marketing tactic is a book signing, school visit or writing a blog regarding your material, it’s a must for any author who has the intention of promoting their name and titles. I wouldn’t be afraid to get creative and think outside the box as well. I’ve done everything from designing environmentally friendly book totes imprinted with The Beantown Tale logo to starting an after-school writing program for elementary school students. What types of marketing are you involved in? I have been involved in signings, lectures at local libraries, book festivals and a regular visitor to New England elementary schools. Technologically, I write a blog bench marking the progress of the series, I utilize a Facebook page called “The Beantown Tales” and manage my own website at www.thebeantowntales.com. I’ve also been active on writing panels, which most of the time I focus on marketing issues. My educational background involves a BS in marketing, which has really come in handy within this industry as well! Have there been any surprises along the way for you? The last two years have been one surprise after the next! It has been a wonderful adventure meeting people, reading to children and learning about the literary industry. I really see the opportunity to write storybooks as a wonderful gift, and it is a gift that I cherish. How has writing enriched your life? For me, it was a doorway into a whole other world that I had never seen before. I was completely out of my comfort zone and that was a really good benefit for me. I have learned so much and feel like I’ve overcome many obstacles including public speaking, which I have always been terrified of. Giving lectures, talking to store buyers and presenting to classrooms is a large part of this job so it’s been an education in itself for me. I also feel that the relationships that I’ve made with other authors, publishers and readers have been the most enriching segment of my experience. I have had children tell me that I have changed the way they see the world and I can honestly say that each and every child that I have met has changed my perspective of the world too, and it is nothing short of a blessing. Do you plan to move beyond children’s books or stick with this genre going forward? I would really love to complete the ten-book series for “The Beantown Tales” but I have already branched out within other genres. Last March, I published a wedding how-to e-book entitled, “Walking Down The Cobblestone Aisles of Boston.” The book is written as a sort of manual for New England brides-to-be and guides them through the decision making process of venues, menu and flowers. It was a fun project to work on. I have also started writing my first mystery, which has been a longtime desire of mine. The formula is definitely different from children’s books, but it has helped me become more well-rounded in the craft. I think it’s important to try new ideas, themes and projects in whatever field you immerse yourself within. It allows us to keep learning and growing. Which writers have influenced you and why? There are many writers who have influenced me through both my love of reading (I love mysteries) and the connections that I have made with other authors. I would have to say the biggest influence by a writer to excite me towards reaching for my own literary career would have been a poet who visited my second grade class while growing up in Andover, Massachusetts. He asked us to write our own stories and then read bits and pieces while telling us what his favorite parts of the storyline, characters or settings were. I remember I wrote a story named, “Sweet Dandruff,” for which he said I won the award for best title. Even today, I think back on the time when I was lucky enough to sit and read with one of the greatest children’s writers of all time, Shel Silverstein. Your books, The Land of Chocolate Cosmos and The Popcorn Hydrangea of Poppingtomhave won the Green Book of 2011 Award and were Honorable mention in the 2011 New England Book Festival. What does that mean to you as an author? 1) Describe your journey to becoming an author. My journey towards becoming an author began from the memories captured during my childhood spent daydreaming in a small shop located in the middle of a big city. As a little girl, I was raised in a family owned, wholesale flower business situated in the Back Bay of Boston where I spent every Saturday morning from the age of five to thirty, enjoying the extraordinary blooms imported from countries around the world. My idea for my first book came from a flower which actually held the scent of chocolate. Using the magnificent colors, shapes and smells surrounding me, I began to envision fantasy lands which coupled with my love of writing poetry, eventually became my children's book series, The Beantown Tales. The inspiration to write these stories stemmed from many places including a desire to strengthen the demand of specialty flowers sold from independent flower shops as well as to encourage brainstorming and problem solving skills from kids towards important issues facing communities. In all honesty though, my greatest source would have to be from my two sons, Lance and Ryan. There isn't anywhere on earth where a writer can find a stronger origin of inspiration for their children's books other than through a young person's imagination. 3) Please tell us about your children’s book series, The Beantown Tales. The Beantown Tales is a collection of children's books written to educate readers about important issues concerning the three main elements of the earth: the environment, humanitarian kindness and endangered animal preservation. All stories possess adventurous worlds as well as child-friendly flowers which aim to entertain and tantalize tummies while empowering young minds to make a change. The first two books within the Green segment of the collection are The Land of Chocolate Cosmos (December 2010) and The Popcorn Hydrangea of Poppingtom (September 2011). The Land of Chocolate Cosmos is a story focusing on the environmental issue of preserving our natural resources by revealing a tale about a community distraught when their chocolate making flower, the chocolate cosmos, becomes abused and overused. As the flower begins to become endangered, the magic of the petals disappears leaving the town without their beloved chocolate. The Popcorn Hydrangea of Poppingtomstays in theme with the first book telling the story of magical popcorn popping flowers which become threatened by disastrous air pollution created by the town's drive-in movie lot. When popcorn production slows to a halt, the community is thrown into action by accepting the help of an environmentally conscious boy, Nicholas, who works to eliminate the problem by writing a new anti pollution act. Both books are illustrated by Kevin Coffey who has produced pictures for Jerry Remy's Wally the Green Monster books and has also worked as an animator for "The Nightmare Before Christmas" film. The series has recently become award winning, earning "Green Book of 2011" from The Greenschools of Massachusetts and an "Honorable Mention" from The 2011 New England Book Festival. Both children's books have also appeared and received accreditation from the popular floral publications, Floral Management (December 2011) and Flowers& (January 2012). 4) Describe how you chose your publisher. My publisher and I found one another under unusual circumstances. I wrote The Land of Chocolate Cosmos within two weeks and showed it to my husband, Rick, who sent it through an email to a few of his friends, who sent it to a few of their friends, and so on. Another two weeks later, I received a phone call from the Mascot Books CEO, Naren Aryl, who invited the story to their line of books. Unorthodox as it may seem, sometimes fate will bring you to just the right place where you've always dreamed of being. 5) What other books have you written? Besides The Beantown Tales series, I have also written a wedding eBook called Walking Down the Cobblestone Aisles of Bostonwhich can be found on "Exotic Flowers" website (http://www.exoticflowers.com) as well as articles for The Examiner, The Patch, and several business websites. I am also in the midst of completing my first murder mystery novel which is really what I have always wanted to write. 6) How do you promote your work? What methods have worked best for you? Social media has been an absolute must for a couple of reasons. For one, this form of advertising is free, making it imperative to utilize when managing budgets and profit margins. Second, these sites are expansive, bringing your words, ideas, and visions to unimaginable places, increasing aspects of sales, exposure and your chances of success. You just never know who is watching or reading which in this case is a great thing! I've also had overwhelming support from friends and family who have been the driving force behind the series. Signings, fan pages, holiday book buying-- not one of these areas would have ever been successful without their help. 7) What are your upcoming plans for 2012? My plans for 2012 include the third Beantown Tales release, The Candy Roses of Cape Care which will complete the Green segment this summer. The story is themed after the issue of water pollution when an enchanted coastline which flourishes with candy growing roses is nearly destroyed when unwanted tourists litter the shore with candy wrappers. So far, this is my favorite story as it takes place in my favorite area of the world, the BEACH! 8) What is your definition of success as an author? Success can come in many forms for many different authors. For some, it's a crowded book signing, a long list of retailers carrying their name or a generous royalty check received in the mail. For me, it's when a letter arrives from a young reader who wants to start a recycling box at home because they feel that they can make a difference or when I visit a school and the kids ask me to teach them, not about how I write my books but how they can write their own. Their excitement is incredible. There really is no better measurement of success than that for me. 9) What advice would you offer to aspiring authors? The first and last thing that I tell my writing students is that Dr. Seuss was rejected from publication 27 times before his manuscript was accepted for publication. If Dr. Seuss had given up, where would we all be now? You can't ever give up, just keep trying! Suzie Hearl Canale grew up in Andover, Massachusetts and is a graduate of Salem State College. She began writing as a children's book author after a twenty-five year career in the wholesale floral industry in Boston where she was inspired by flowers named after child friendly foods. She developed the concept of The Beantown Tales which are series of books geared towards educating children to make positive changes within the key concerns of our society. Suzie is the recent recipient of the Green Difference Award for Green Book of 2011 by the Massachusetts Green Schools Organization as well as an Honorable Mention in the 2011 New England Book Festival children's division for her first installment of the Green Series, The Land of Chocolate Cosmos. As she continues her career by writing books, articles and blogs for online websites, magazines and local businesses, she is also busily raising her two sons and volunteering for the Mass Bay American Red Cross chapter as a member of the Disaster Relief division. Author has the first of a planned series of children's books published. Suzie Canale grew up surrounded by flowers, working in her family’s wholesale flower business. The West Roxbury resident remembers back when she was 10-years-old, opening up a case of flowers that had come from Holland, and catching a whiff of chocolate. Her parents told her it was the aroma of the chocolate cosmos flower. Canale thought, right then, that it might be fun to write a story about it someday. With the publication of her first book, “The Land of Chocolate Cosmos,” that dream has come true. The book is about a young boy who helps solve a chocolate shortage problem through environmentalism. Q. What got you to finally do this project? A. I’ve always written poetry, and about six months after I had my second child, I picked up a pad of paper and just started writing the story. I thought it would be fun to tie it to issues that would teach something to children. Environmental issues are very important, so I started with that, and combined the two. I finished it and gave it to my husband and he said, “We’ve gotta do something with this.” He sent it by email to a friend, and his friend sent it out to six friends and those friends sent it out to six other friends. And two weeks later I got a call from a publisher in Virginia saying we just found your story in our email box and we’d like to publish it. Q. So how long was it from the time you started writing till you heard it was going to be published? A. The whole process was about a month. I know it doesn’t usually happen like that, but I had sat on the idea for 20 years so that kind of makes up for it. Q. How long did the actual writing take? A. I did that in two weeks. I would write it when my kids were taking a nap or when I was on the T or anywhere I had a few minutes to steal. Q. What age group is the book aimed at? A. When I wrote it I was thinking of 5- to 8-year-olds. But the feedback I’ve gotten, which makes me very happy, is that it’s going older. It’s being used in a lot of second- and third-grade classes. So maybe it’s more for 6 to 10. Q. There are some big words in the story, such as lucrative and mahogany. Was part of the plan to have kids build up their vocabulary? A. After I wrote it, I gave it to my mother and my husband to read, and they both said, “Are you really using the word lucrative?” I said absolutely. We don’t we give kids enough credit. I think they can handle words and I think they appreciate not being talked down to. So they might pull some of those words away from my book and use them in classrooms. I didn’t overload the story with them, but it was intentional. Q. What’s your next book? A. It’s called “The Popcorn Hydrangeas of Poppington.” It’s about these popcorn hydrangeas – which is also a real flower – that need pure air to pop. It’s about a town that has a huge drive-in movie lot, and the people depend on the popcorn from the flowers. But too many cars come to the movie lot and the air pollution causes problems. Q. So these two books are part of the Beantown Tales? A. The plan is to have 10 books of Beantown Tales. The first three books in that collection will be the Green Series, which are dedicated to environmental issues. “Chocolate Cosmos” is the first. The Do Good Series is the second set of books; they’re about being kind to others, with subjects including Meals on Wheels and the Walk for Hunger. The third set is the Animal Friendly series, which will be about endangered animals. Flowers will be present in all of them, and they’ll all be in poetry form. The tenth book will have all the characters come together and solve a big issue, which will probably be world peace. “The Land of Chocolate Cosmos” can be purchased at amazon.com, barnesandnoble.com, mascotbooks.com, and at Exotic Flowers in Roslindale, which is owned by Suzie’s husband Rick.